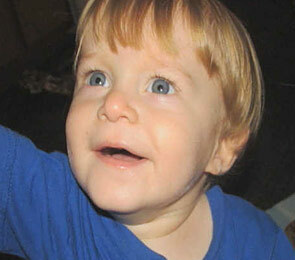 Declan Moss, 18-months old, and his grandfather's two fatally attacking pit bull-mixes. UPDATE 01/23/15: The Hernando County Sheriff's Office released still images of both fatally attacking dogs to their Facebook page yesterday along with a message to so-called "animal lovers" who are upset that the sheriff's office also allowed the media to capture video footage of the dogs. 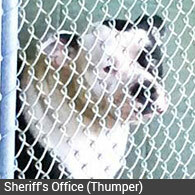 Max and Thumper, both male pit bull-mixes, attacked and killed 18-month old Declan Moss on Monday. Quickly afterward, his mother Sheila Moss defended the breed of the dog. We greatly thank the sheriff's office for releasing the images. Doing so provides an excellent public service. Also, to clarify the "animal lover" language, the vast majority of Facebook users complaining to the sheriff's office were pit bull advocates, upset that images identifying the breed of dog were released to the public at all. 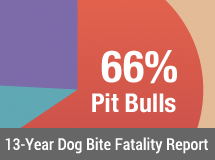 They do not want another damning fatal attack stacked onto the breed's horrific track record, which kills more people than all dog breeds combined. Watch Nienhuis closely. He appears to be "struggling" as he speaks those underlined statements. Why is that? Because it is outrageous that a devastated young mother would ever say these things -- rushing to defend the breed of dog and piling on pro-pit bull propaganda -- in the immediate wake of her own child's vicious dog mauling death. How will the veterinarian rule on the breed of the dogs? Perhaps an Alapaha Blue-Blood Bulldog or other known pit bull mislabel? In a separate video, neighbor Charles Shorey breaks down on camera. "He was a beautiful kid. I feel sorry for the mother. She's single. She's fighting and struggling," Shorey said. It is unclear if it was Shorey or another neighbor who told News Channel 8 the dogs were pit bulls and had killed smaller dogs in the past. The grandfather was babysitting when he saw his grandson was in trouble, the segment states, "but he couldn't get the dogs off the baby and off of each other." 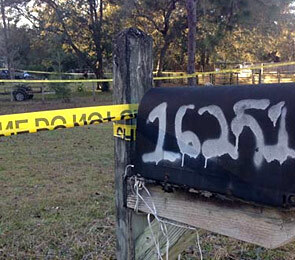 Brooksville, FL - Two family dogs attacked and killed an 18-month old boy on Monday. When authorities arrived at the home at 16251 Cherokee Road, they found Declan Moss1 deceased from injuries inflicted by the dogs. 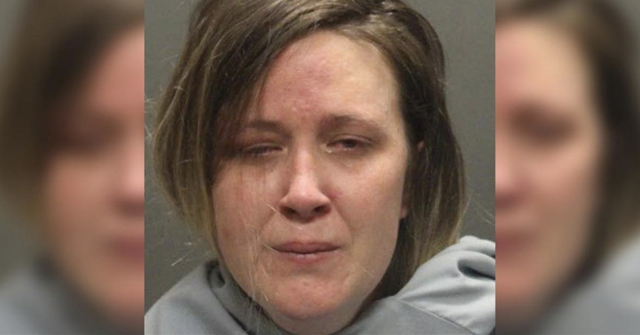 Michael Terry, spokesman for the Hernando County Sheriff's Office, said that Declan had been playing on the home's porch while his grandfather, Gregory Moss, 51, watched him. The grandfather was home alone with the child and witnessed the attack, Terry said. 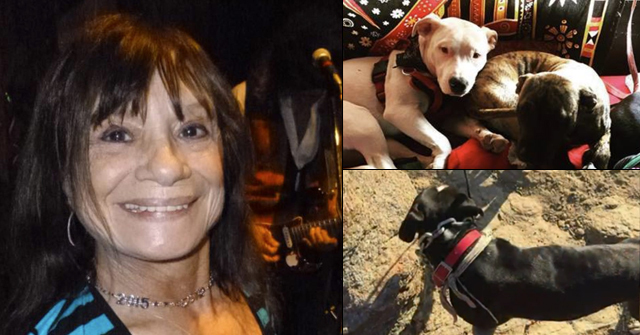 The Sheriff's Office is unsure of the breeds of the two attacking dogs, calling the animals "mix-breeds" temporarily as they await additional information from a veterinarian (The Daily Mail reports that neighbors described the two dogs as pit bulls.). 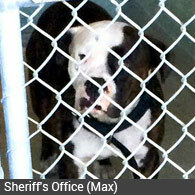 The attacking dogs, ages 2 and 6, were seized and removed from the home. Two other dogs owned by the family were not involved in the attack and were left at the family's home. Detectives are still on scene investigating. Last year, Florida had five fatal dog attacks. The only state to outnumber it was Texas with seven. 1Early news reports misspelled his name as "Declin" Moss. Thank you so much for providing this site of REASON and rationality. It validates what should be basic survival instincts in all of us. Dr Laura recently made a statement regarding pit bulls and immediately the nutters descended upon her. They even combined efforts to have some of her sponsors pull their support. Despicable. So the grandfather admits he knew these dogs were dangerous and let them kill pets in the neighborhood? If they had, this child would be alive today. All the pit bulls that kill children start by attacking other dogs. It's a prime sign of trouble. I think the officer wanted the public to know where mom's priorities were. I'm glad he said that. Did that segment never get on the online news outlet? That fact that the mother is reflexively spouting pit bull breed propaganda moments after learning of her son's death means she was fully aware of the dangers and had been "proving" a point with her pit bulls. And using her son to do it. I wonder what the other dogs were that didn't attack. 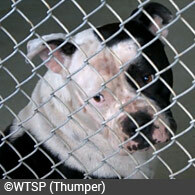 Were they crated while the pits were rotated out because the pits were merely dog aggressive? Yeah, pits that only first appear to attack other dogs often eventually also attack people. Points proven. Snack sized dog — the sentiments of the mother made the final evening news segment of Fox 13. When there are breaking news stories and brief segments run throughout that day (hot tipper filmed one from own TV) it is hard to know which ones will be included in the final evening news segment. Fox 13 thought the statements were important enough to be left in. And in fact, it was Shorey who identified the attacking dogs as pit bulls. Fox 13 also identified the breeding factor in their evening segment, "They [the dogs] are 2 and 6 years old and the older one is actually the father to the younger one." Good job Fox 13! My son is 18 months old…I have no comprehension how a mother can defend a damn dog after it kills her child. Mine are 10 and 6. These stories bring tears to my eyes. As a mother, I hate to judge other mothers. I can understand mistakes and falling for the pit hype but the excuse the dog that just murdered my child?? Maybe she's just in shock? More breeders. There were other dogs that happened to be in the house. More breeding stock? Can pit bull advocates see that opposing regulation just means the proliferation of breeders adding to the surplus? Why do they think pit bull advocacy, which is at its heart breeder driven, opposes breeder regulation and wants to let them off scot free? This seems to be a street that we all can get together on. Isn't this a point that pit bull advocates And victim advocates can get together on- Breeder Regulation. There needs to be some law and order because both people, other pets and farm animals, and the pit bulls, suffer when there is no regulation and no required responsibility. No more promises from breeders, they never keep them. They make everyone else pay. Proof and laws required. The fighting breed apologists are complaining that the truth was revealed through photos and video by law enforcement. These dogs that killed little Declan were pit bulls that belonged to the grandfather who had bred them. Pit bull advocacy had tried to silence and hide the truth. But the neighbors are now coming out with more of the truth, and some of them have regrets that they didn't do more earlier. These dogs have been terrorizing the neighborhood. If only, if only the neighbors had been filing complaints, collecting video evidence, and insisting that police declare these dogs dangerous. Little Declan would still be alive if they had. I hope people understand they have to do the right thing and make those complaints and file those lawsuits, and get police to do something the first time. They have to fight for their own rights, and the rights of these children who will die if people stay uninvolved and let it go on. "These 2 "beautiful" dogs are animal killers. It was only a matter of time before they turned." Pit bulls that kill children start by displaying aggression to other pets. It's a prime marker and warning that something serious must be done to hold the owners accountable. Why, why did people let themselves get terrorized and their pets killed? Why did they do nothing? By doing nothing, that led to this. I am trying to figure out why. Is it possible for victim advocacy groups to provide some clear information and guides to people in these situations about what recourse they can take, and how to make effective and documentable complaints? Perhaps written by an attorney. People are floundering about, victimized, and unsure how to handle the complaint process or where to even make complaints. They need help and guidelines. 1. It's hard to imagine that a dog will kill a child. These dogs were probably lovable wigglebutts with people, right up until the moment they weren't. Those of us who come to this sight can see what will happen, but most people are clueless. 2. As horrible as it is to have an aggressive dog invade your property and kill your pet, these dog owners are still your neighbors. You have to live next to them. You have to try to find a peaceful solution because moving isn't really an option. 3. Your neighbor will make all sorts of promises about keeping the dogs on his own property. "I'm really sorry, I don't know how Mr. Wiggles got out. It won't happen again." 4. The dog owner and everyone else you talk to will play down the incident and make you feel like you're making a big deal over nothing. "Mr. Wiggles was just playing. He's didn't understand that he was hurting your dog. It won't happen again." 5. You call Animal Control and they either don't respond, or say they can't do anything because, by the time they did respond, the dog was back on its own property, acting like the sweetest pet in the world. Joelande, you are absolutely correct that this death could have been prevented if the neighbors had gotten together and called, called, called and made a huge fuss about these dogs. It's just so hard to get AC to do something serious. And it's so hard to get others to believe that human lives are actually at stake. A loving pet killing a child is such an abomination that people don't want to believe that it could happen. Neighborhoods like mine do need help. I don't have any answers. We had a couple of hicks move in with grandma next door. They could never afford a house in our neighborhood but Grandma did and that's as good as it gets! Within two weeks of living in the big league they managed to bring in two strays to tear up Grandmas garden that she so lovingly and deligently tended to over 40 years. They also terrorized the neighborhood plenty since Grandson Doofus never learned to close the door behind him. One of these dogs looks like a pitbull although they assure me it's a blue tick hound. Which looks nothing like a blue tick hound. After it ate its way through our fence in a matter of minutes, my husband had to punch it in it's head to keep it from busting all the way through. There's nothing quite like enjoying a day at your pool to see Cujo baring his teeth and growling at your young daughters. We knew that next time, we wouldn't be so lucky and we'd have to shoot him. My husband calmly and rationally explained to the neighbors that we called the police to warn them there may be a shooting soon. The neighbors said the dog only becomes irritable when he hears people having fun without him. Maybe we shouldn't have fun in our backyard now? Anyway, now that everyone's on the same page, the fence has been repaired, they got an electric fence for their side to keep from digging, and my husband has to pack heat just to play in his pool with his daughters. Ah, Summertime and the living is easy. Farmer Jane, thank you for your post. It is so helpful to try to dig through all this and find out why. It's hard for me to understand because in my experience, right from the beginning, at the first sign of this kind of behavior, these people and the town would have had a lawyer crawling all over this and also dealing with the state with regard to child safety issues at the home. I need to understand that doesn't happen everywhere and I want to understand why different areas respond differently. I am thinking that some people need to have access to those with experience making these kinds of complaints and documentation, and guiding them through the system, especially if that system is corrupted or ineffective. I knew something was up when I saw a complaint blitz being organized on a pit bull industry lobbying site that was Outside the state of Florida. A leader in that complaint effort (to get pit bull business lobbyists and followers to disgustingly bully and attack the sheriff's office for doing their job, and also to try to silence discussion about these breeds ) is a name I recognize from all over the internet, all day and every day in an obsessive rant, not only spreading lies like the nanny dog lie but attacking people who reveal the truth about these fighting breeds or report incidents, including victims, with the vilest language and threats. A chieftess among the victim blamers. Yet now this same person has tried a new tactic on the fb page of that sheriff's office of pretending that all she cares about is the victim and trying to trick people into silencing the topic of the fighting breeds bred in the home with aggressive history that killed the victim. The sheriff's office in this county needs to know that these fake complaints are business-organized and are primarily from people who don't even live in the state of Florida, who profit from hiding the truth about fighting breeds. Some don't even live in the country. Let the criminals rant. Let the lobbyists try their tricks. They are guilty and the world is waking up to their lies and greed, as well as their cheap bullying tactics. Nickname unavailable, thank you for sharing your experience. May I suggest that you and your husband file a written complaint with animal control and the police department about this aggressive behavior, so that it is on file and documented when injury occurs and no one can say that they have no record. Also people like this who hope to score Grandma's house someday will sometimes understand the concept that if those dogs hurt anyone, Grandma's house and other assets may be lost through lawsuits. Many of them do understand the repercussions of lawsuits, and they won't get what they want, and now they can't claim they didn't know. 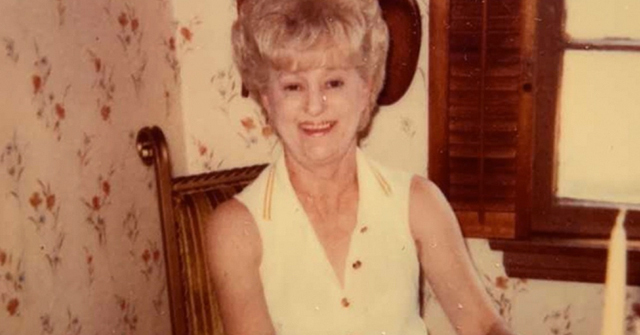 The best of all is a registered letter to Grandma or the property owner listed in the deeds or the assessor's office (check online or with the town) reminding her of this and putting her on notice about the dogs' aggressive behavior and laws broken, which can often cause immediate change, or later a lawyer can use when injury occurs. Documentation is the first step and the most important. If the dogs are a danger to Grandma, that can also be considered elder abuse or endangerment and there are departments in states that address these complaints and issues, some more effective than others, and sometimes people in the police department who handle these issues. It almost sounds as if they want her to get hurt. As for the blue tick hound that isn't, I am sure the rescue or craigslist poster that wanted to dump a pit bull mix flat out lied to these people. Whether they know it or not is another issue. Thsnk you all for thinking and acting about this crisis. Colleen, I'll donate soon. Good work with the victim and perps photo combos. Well done. Farmer Jane, thank you. I sent a thanks comments for your post but it may not have gotten through. I hope these kinds of issues can be explored through victim's groups and that people can find sources of ideas and support for how to prevent these atrocities. Joelande, thank you so much for the advice. We erroneously thought warning the police we might have to shoot was formal enough. Had no idea about all the other things you listed that need to be done. Yes grandma's house, her things and the vast array of Grandson's wheel toys might be in jeopardy of lawsuit. Any sane person would worry more about their health and safety, but sometimes money speaks louder to these people. Good advice joelande. I agree, the only way to force irresponsible neighbors and local public safety officials to do their jobs is to become the squeaky wheel. There must be a paper trail you can use to beat them over the head with. Which is easy to say when it isn't you having to live in the situation with neighbors like that. Nickname unavailable, we are in a somewhat similar situation. Really nice neighborhood where everyone has labs, golden doodles, lahsa apsos, and other normal dog breeds. Last fall someone got a pit bull and walks it in the neighborhood on a lightweight retractable leash. The owner is too young to be a homeowner here himself so I'm guessing he's someone's son/grandson who hasn't been able to find a job after college. I now do not go out of doors without being appropriately armed. This doofus even takes the dog to the neighborhood playground. Inconsiderate fool. Molly Thewad, I am formerly nickname unavailable – I think you're right. We are only going to see more of this infiltrating into nicer places as many of these young adults do not have the skills to make it on their own yet they've been able to convince their parents how awesome the pitbull they brought home from college is. Pit bull "rescuer"s (I hate that word) are frequently quite young. And lacking in job/social/life skills. That's why you see them living with Mommy and Daddy. One wonders if the pit bull has been declared on the parents' insurance policy. Good point Your Quiet Neighbor, if they lived anywhere near my house or I could figure out where they are in the neighborhood, I'd try to find out. I've seen the thing being walked a couple of times and at the playground once. My husband also saw it being walked around on Halloween night when he took our daughter trick-or-treating, so clearly the owner has no common sense whatsoever. Thankfully we are moving soon but it is worrisome that even if you are successful enough to be able to live in an upscale area, you are no longer safe from the infestation. I am glad for my concealed carry permit but I'd certainly rather not have to exercise that right. Great article. It made me to think about donating something and soon I'll contact you to donate something.